Have you ever wondered what happens to your online identity when you are no more? What happens with the thoughts that you have shared over the internet? What happens when people on the internet don't know that you are dead? Too many questions? I recently read Exit Point, a book by Anil Goel has an answer to these questions. The book is a fictional work and hence the answers are fictional too but they are thought provoking. Exit Point has one lead character, among many, running the show and that's Alok. Alok is too intelligent for his age and is already the think thank behind one of the largest tech companies. He is one of those socially introvert in real life but digitally extrovert kind of person who could hack into almost anything. By anything I mean literally any website or server over any network in the universe. Technically speaking it is a multi-thread story which starts from threads like the death of some sharks off the coast of a beach, breakdown of Internet in Australia, death of a girl in Australia who was interacting online with a girl already dead in Hong Kong, etc, etc.. Just as the internet is not restricted by international borders, the story is not restricted by physical limitations of human quest. The entire story keeps you on the edge wondering why, how and where is the root cause of the problem that has kept the official of Australian Intelligence and Alok on their toes. The story covers the online phenomenon in general and how we as humans are heading in the future with the advent of technology in particular. The entire story is set in the future, starting from 2016. 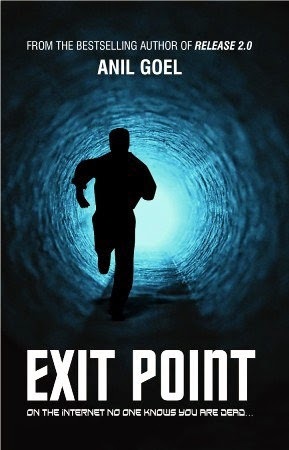 The book, Exit Point, stands true on the tagline, "On The Internet No One Knows You Are Dead...". Every single chapter would make you think, if not this then what next? I would recommend this book to readers who love fiction, technology and suspense. The entire story, though fictional, is so gripping that you will think it's real and you are a part of it in your day to day life. Hi Vishal, thanks for the verdict :D I do agree that we should have control over what we post but then we would question ourselves about the Freedom of Speech.